District Attock lies in the north-western region of Punjab, Pakistan. It is further subdivided into six tehsils wich are Attock , Fatehjang, Hazro, Hassanabdal, Pindigheb & Jand. 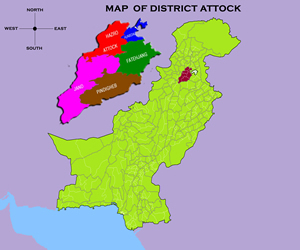 Attock District is bordered by the Swabi and Haripur districts to the north while the districts of Kohat and nowshera to the west, the district of Rawalpindi to the east, the district of Chakwal to the southeast, the district of Mainwali to the southwest, The river Indus forms the western boundary of the district. According to the 1998 census of Pakistan the district had a population of 1,274,935 of which 20.45% were urban. The estimated population was 1.58 million in 2008. The name of district is derived from a small town called Attock Khurd, in the Punjab, on the left or east bank of the Indus, 942 miles from the sea, and close below the place where it receives the water of the Kabul River and first becomes navigable. The name, signifying obstacle, is supposed to have been given to it. Attock Khurd (the old city) has a rich history, during 520 BC it was under the influence of Gandhara civilization as it was located just 30 miles to Taxila, the capital of Gandhara civilization. The utter most importance of Attock was that it was located on the the principal route of international commerce and communication between the India, Persia and China. The name of new city "cambellpur" came after Sir Colin Campbell an officer of British Indian army and it became a Tehsil of Rawalpindi district in 1849. In April 1904 it was raised as district by the merging the tahsils of Talagang, Pindigheb, Fatehjang and Campbellpur of the Punjab province of then British India. After independence (1947), the name of the district, tehsil & city was changed back to Attock By the Government of Pakistan in 1978 . 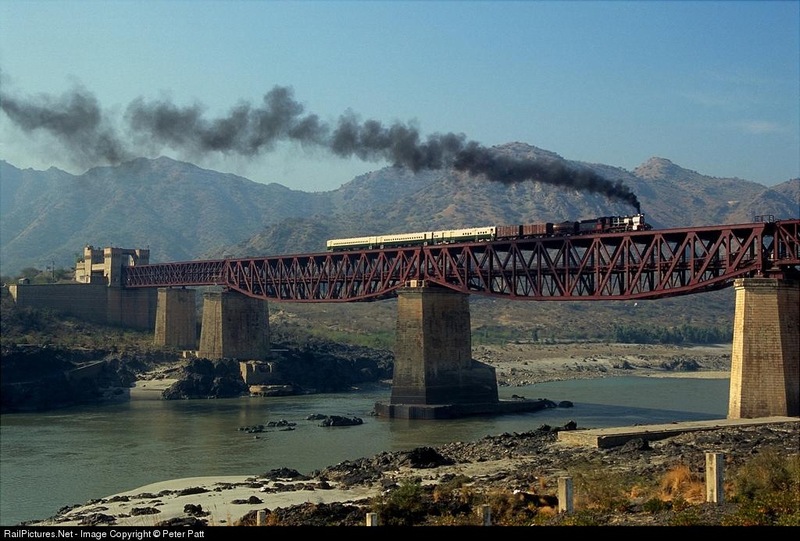 Attock ranks 16th among the highest litracy rate cities of pakistan. Attock's urban pouplation is mostly highly educated. while the trends of rural population is also shifting towards education. following are some the major educational institues in Attock. 1. Comsats Intitute of information Technology. 1. Attock Degree college, Attock. 2. Fizaia degree college F6-RF, Kamra, Attock. 3. Fizaia degree college MRF, Kamra, Attock. Attock District has a climate of hot summers and cold winters. The northern part of the district is more humid and is more moderate in climate relative to the southern part of the district due to the higher altitude. Geographically, the district is mainly hills, plateaus and dissected plains. The Indus River flows on the northern and western borders of the district. The 435 miles long journey of River Kabul starts just west of the Kabul city in Afghanistan and ends at Attock where it ultimately falls into the River Indus as well the Haro River as it passes through the northern regions of Attock, before falling into Indus it forms a flood plain with fertile soil. The District's average annual rainfall is 783 mm.